Overview: Dedicated to the majestic days of the Roman Empire and its most outstanding general and Emperor Julius Caesar, Glory of Rome is redolent with the proud golden eagles and scarlet banners of the great legions, beautiful Vestal Virgins, dangerous gladiators and the raw power of history's most potent and far flung empire. 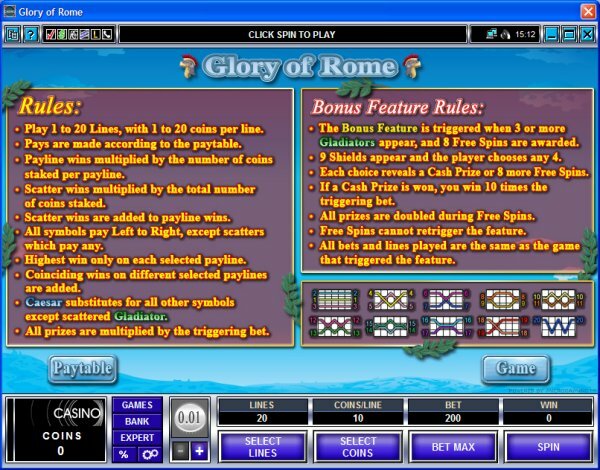 The august Caesar himself is the Wild in this enthralling game, which features Wild, Scatter, Free Spins and the riches of Rome in a special bonus feature. Gladiators across the reels are the ultimate Scatter, and with three or more the special bonus feature is triggered, presenting you with 9 colorful legionary shields from which you may choose 4. Each one you choose offers the opportunity of either a cash reward or 10 Free Spins, where winnings are doubled to top up your personal treasure chest! 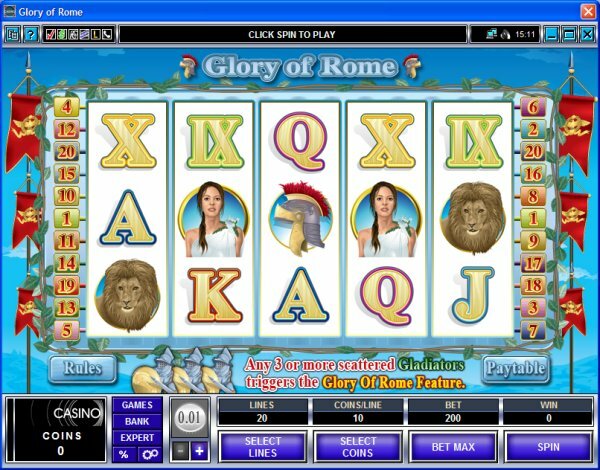 Take the road to Glory of Rome and see for yourself the riches of empire on this powerful new slot. 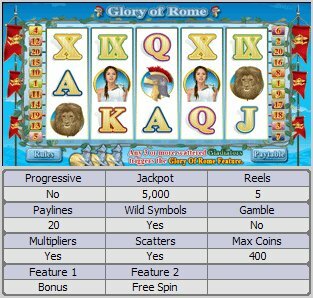 Similar Slots: If you like Glory of Rome, you might like these other 5-reel slot machines: Big Top, Dragon Lady, Reel Thunder, Spring Break, Wealth Spa, Witches Wealth.